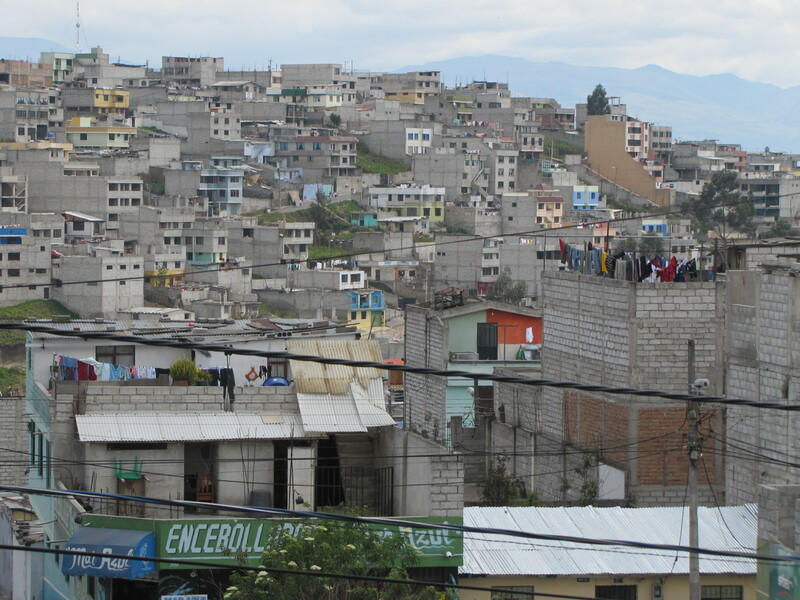 Welcome to Quito, Ecuador where I awake each morning to trilling songbirds, barking dogs and rumbling jet engines. This capital city of 2.1 million people sits at nearly 10,000-feet in a narrow valley bounded by Andean volcanoes, some of which are capped with snow year-round. The dense city measures about 29-miles long and 5-miles wide. The chaotic streets play host to cars, buses, motorcycles, four-wheelers, pedestrians, vendors and entertainers, including jugglers trying to earn some cash (U.S. dollars) before the traffic light turns green. Speaking of lights, they get shut off for about two hours each day in different sections of this city due to a country-wide electricity rationing program, which began in November. A severe drought has kept Ecuador dry since September. “It is the first time in forty years that the climate is so, so dry,” said economist Franklin Canelos of the Latin American Council of Churches. A handful of hydropower plants produce about 60 percent of the country’s electricity, Canelos said. But now the plants are running at low capacity due to the rain shortage. In southern Ecuador, reservoir water levels have dropped significantly at the Paute River dam, which supplies Quito’s electricity. The rolling blackouts, designed to conserve electricity, darken apartments, schools, churches and some business offices (many have generators.) When the traffic lights dim, policemen take to the bustling streets to direct traffic. For the most part, life in this city goes on, though not everyone is happy about it. The blackouts are likely to continue until March, when steady rainfall should return. Maybe the U.S. should have rolling blackouts too, so we can get some perspective on this stuff! Thinking of you and hope you are well. Hi Becky, Such a good commentary and photos of your stay in Quito so far..I really enjoyed the comments along with accompanying photos, especially the one of “las abuelitas!! wonder why?? Look forward to your next set..
It’s inspiring to follow your travels — have you thought of posting your complete itinerary? I’d love to be able to anticipate your next steps, but maybe the schedule is less predictable than that. At any rate, I’m enjoying my armchair journey!